You can’t use your treadmill all of the time. Sure, it gets more use than that one owned by a friend or relative that sits in the corner and is now a new coatrack, but it’s physically impossible to be on one all of the time. When you need to take a break, either for the night or for a week to recuperate, it’s important to make sure such expensive equipment is protected. Enter the treadmill cover. Manufacturers designed this object to protect treadmills from water, dust, and other materials that can make the machine lose function over time. Having a cover is especially important if the treadmill is kept somewhere damp or unused, such as a basement. But are all covers made equal? The short answer is no, while the long one is slightly more complicated. In general, covers all serve the same function, but some will be more reliable or more expensive than others. Below is a review of the top four makers and models of treadmill covers, as well as some average price points and how they can benefit an athlete such as yourself. Before I completely dive in, the value of the covers vary. Some are designed for higher end treadmills (around $1000) and some are designed for the budget levels ($400-$500 range). 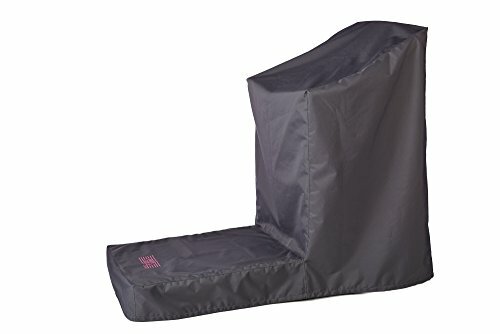 Why Do I Need A Treadmill Cover? You only need to watch the first 30 seconds of this video to understand what a treadmill cover is. Essentially, it is a piece of fabric or synthetic material that covers either a folding or static machine and helps keep dust and moisture away. Treadmill owners need to measure the height, width, and length of their machine to figure out what size cover to purchase. Most covers in contemporary times are made out of synthetics like vinyl. The dictionary defines vinyl as a synthetic resin or plastic made from something called a polyvinyl chloride. You will most likely recognize it as the material used to make old records, flooring, the covers for plastic booths, and ridiculous dancing outfits from the 1970s – not to be confused with polyester. Vinyl is a popular choice for treadmill covers because it is waterproof and easy to clean. All you usually have to do is wet a cloth and wipe away dust, smears, and stains. It’s also difficult for materials to penetrate and will not let liquids seep past its fibers and wreak havoc on treadmill machinery. Several of the most popular covers use vinyl or a related product. If you’re worried about waterproofing, be sure to read what the cover is made out of before purchasing it. Another option is polyester, which is a strong and durable synthetic material. Not everyone does this, but many runners enjoy being able to breathe in fresh air while they run, even if they don’t have any trails nearby. LiveStrong identified some potential problems with outdoor treadmills, but also discusses how they can be kept safe. Of particular importance is having a cover so moisture and condensation doesn’t enter the motor and stop the machine from working. A cover for the treadmill also prevents less kosher problems, such as messes created by animals – we’re looking at you, birds. 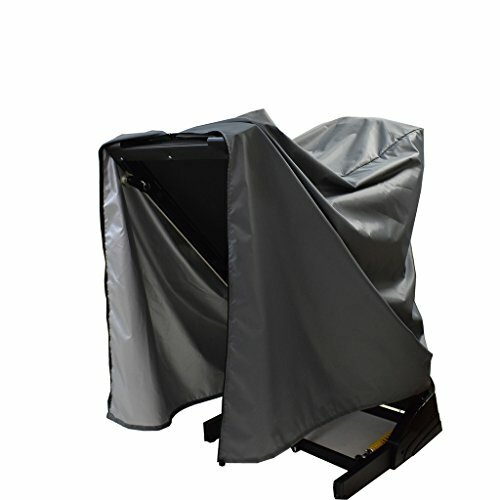 Mini Lustrous designs treadmill covers for non-folding machines that need protection. It is slightly more expensive than other models, but showcases some extra features like internal seams for added durability. It claims to be waterproof, weather-resistant, dust-proof, and able to withstand most forms of weather outside of extremely powerful storms. The Mini Lustrous cover comes in gray and has an elastic hem cord so users can adjust the size to suit their needs. Its average size is 73 x 36 x 61 in., so it should be large enough for most treadmills. People can choose from small, medium, or large models if they need extra space or size considerations. This cover is made from polyester and has a simple design. A user can simply unfold the material and slip it over the treadmill before adjusting the fit at the bottom. People can choose between black and gray. Equip, Inc. is extremely expensive, but they aren’t considered the best for no reason. A single cover for a non-folding treadmill can cost up to $180 but comes in special fabrics for indoor and outdoor use. It can be opened and closed with a simple zipper and comes in multiple colors, including black, tan, and gray. The company designed its fabric specifically to cover valuable treadmills. Equip, Inc. claims that its material is water, mold, mildew, and UV ray resistant. It is also waterproof and dust-proof while being easy to clean and maintain. Available in Outdoor and Indoor fabrics. A standard non-folding treadmill cover measures 81 x 35 x 60 in. However, people can choose from a myriad of other sizes like compact, medium, large, and extra large. It can be tightened around the bottom and is made from a durable yet lightweight fabric. UnderCover by CHANGE is similar to Equip, Inc. in that it uses a specialty fabric to prevent all sorts of hazards from reaching treadmills, including water, mold, mildew, and UV radiation from the sun. People can clean the material easily, and it is also water and dust-proof. Ideal to protect against household dirt, dust, pet hair, debris and weather. This company manufactures covers for non-folding treadmills and is expensive, with an average price of $175 to $200. The material is durable and long-lasting, and it even comes with a separate bag for storage. The cover should be able to withstand the hazards of an interior and exterior environment. It weighs roughly 7 lbs. UnderCover by CHANGE comes in several sizes, including small, medium, large, and extra large. Most people purchase the medium which measures at 77 x 39 x 65 in. There is a 3-year no-fade warranty on the material. 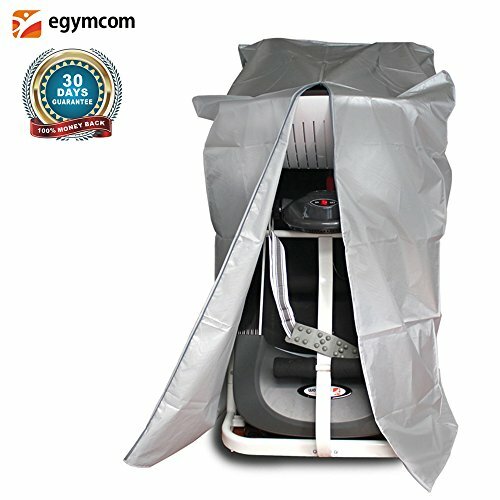 Egymcom is a smaller manufacturer which develops covers for folding treadmills. 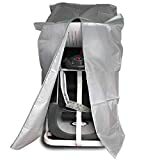 Their silver treadmill cover is a popular model because it is affordable, lightweight, and easy to place on the machine. It has a long zipper in the front that makes it easy for athletes to open or close the cover. The Egymcom is made from polyester and claims to be waterproof, dust-proof, environmental, and easy to clean since it can be wiped off. It only costs $24, which is why it’s popular with athletes who don’t want to spend more money than they have to for quality equipment. This cover is smaller than some other models because it was designed for folding treadmills. The standard measurements are 37 x 29 x 63 in. At first glance, all of the brands seem similar. Indeed, each one is completely capable of defending a treadmill from the hazards of indoor and outdoor living. The main differences come down to what material the cover is made out of and whether or not it comes with a warranty, can be tightened, and is large enough for your treadmill. First, you need to figure out if your treadmill is folding or non-folding. It’s harder to purchase covers for folding treadmills since they are a relatively recent development and most athletes prefer a non-folding because it can contain a more powerful motor. If you have a folding, you might want to pick the Egymcon because it is small enough. Non-folding treadmills have more options. You then want to make a decision about price and material. Brands which use stronger, more specialized, and more durable fabrics such as Equip, Inc. and UnderCover will cost more but tend to last longer. Alternatively, people who want something inexpensive but full size can choose Mini Lustrous. As with everything in life, the best treadmill cover is going to come down to what you need. People seeking a reliable model with some flexibility and variation should go with anything by Equip, Inc. while those with a non-folding treadmill would prefer Mini Lustrous. 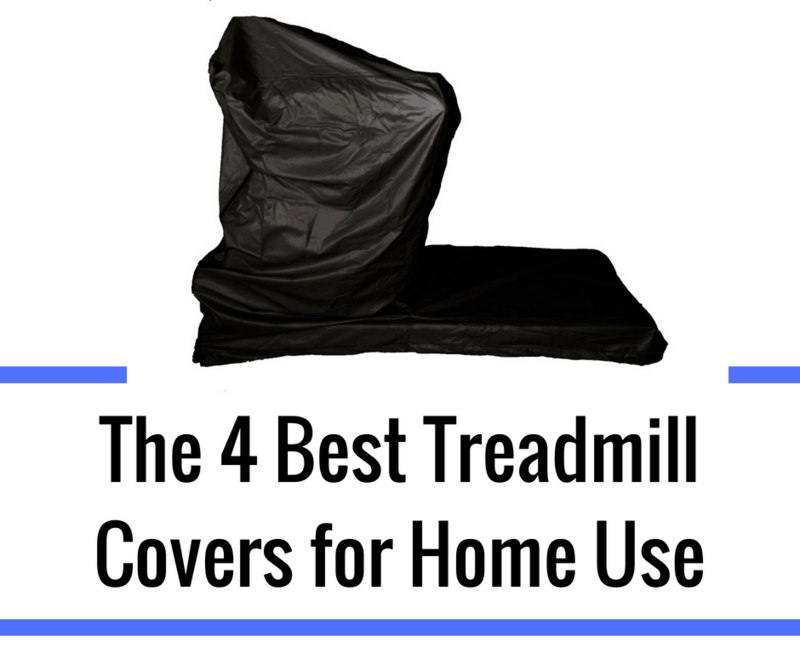 Overall, just be sure to pick a cover that you know will protect your treadmill since they are expensive and no one wants to lose their investment and means to exercise!